September 10 , by Mardi Robyn. Bird’s Nest jewelry is beautiful to me. Maybe because I love birds and like to watch for the eggs to hatch in the nests that sit in trees in our yard during Springtime. 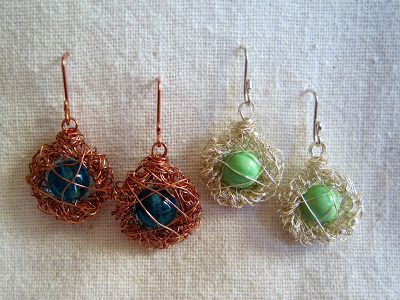 This tutorial will show you how to crochet wire to create lovely earrings like the Bird Nest Earrings pictured. You can use a variety of colored beads and wire. If you like jewelry that is different, maybe think outside the box and use different color combinations like pink wire and orange beads. Have fun creating! Wow so cute! I think these are lovely too. Can’t wait to try this project for myself!